View of the balcony auditorium after multiplexing. 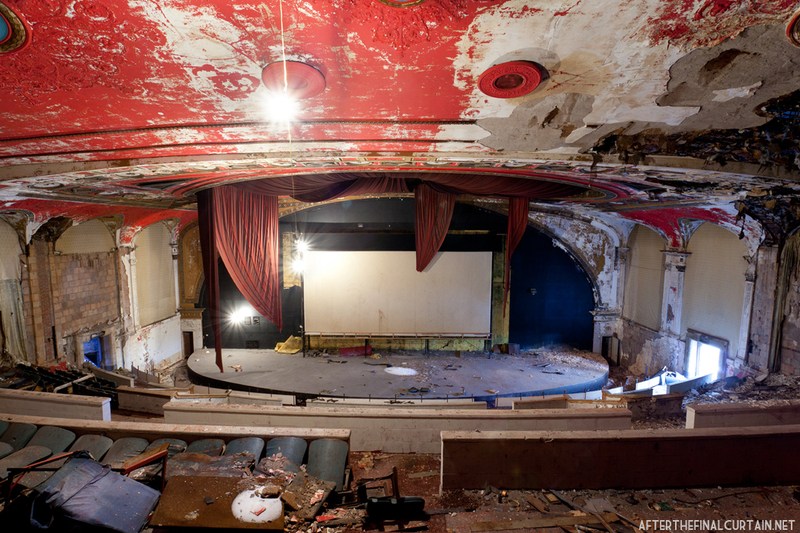 The Fabian Theatre opened on December 14, 1925 in Paterson, New Jersey. 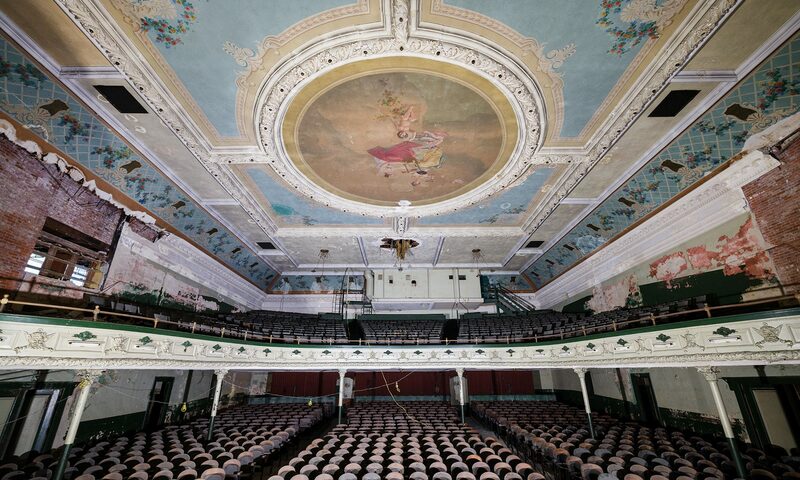 Designed by Paterson architect Fred Wesley Wentworth for theater magnate Jacob Fabian, the 3,228 seat theater was built in a Sullivanesque style with a two ton chandelier, tile floors, murals, and Turkish baths in the basement. The foyer of the Fabian Theatre. The Fabian opened with the silent film “We Moderns” as well as a performance from the Fabian Grand Orchestra. Several of the comedy duo Abbott and Costello’s film premiers were held at the Fabian, due to it being in Lou Costello’s hometown. The films shown were “One Night in the Tropics,” “Abbott and Costello in the Foreign Legion” and “Jack and the Beanstalk.” In 1948, Reverend Charles Tarter, a civil rights pioneer, challenged segregation by repeatedly sitting in the main level of the auditorium at a time when African Americans were only allowed to sit in the balcony. View of the back of the balcony auditorium from the stage. Shortly after opening, the Fabian Theatre Chain merged with Stanley Warner, who modernized the theater in 1962. The standing area at the back of the main level of the auditorium was cut off from the seats by a glass wall. The seating was reduced by 500, the chandelier was replaced and a new projection equipment and sound system were installed. All of the marble in the theater was cleaned and repolished by the same company that originally installed it almost 40 years earlier. Some of the original plaster work shows through a modern renovation. In July 1977, the theater was sold to Theater Management Associates, who turned it into a triplex. 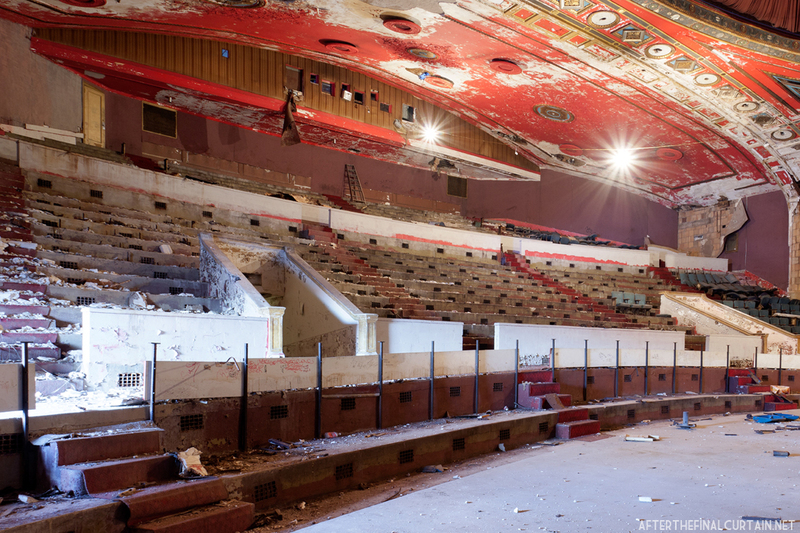 The main level was divided into two 500 seat theaters, and the 1,200 seats on the balcony. The Fabian reopened in late 1977 as the Fabian 1-2-3. Two additional screens were added to the stage area in the early 1980s. The Fabian closed in late 1993. 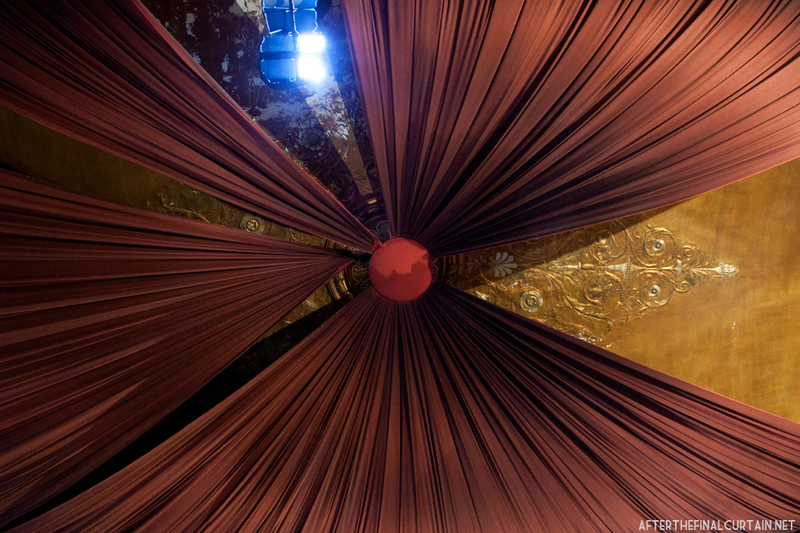 The proscenium arch was covered up during the 1977 triplexing of the theater. 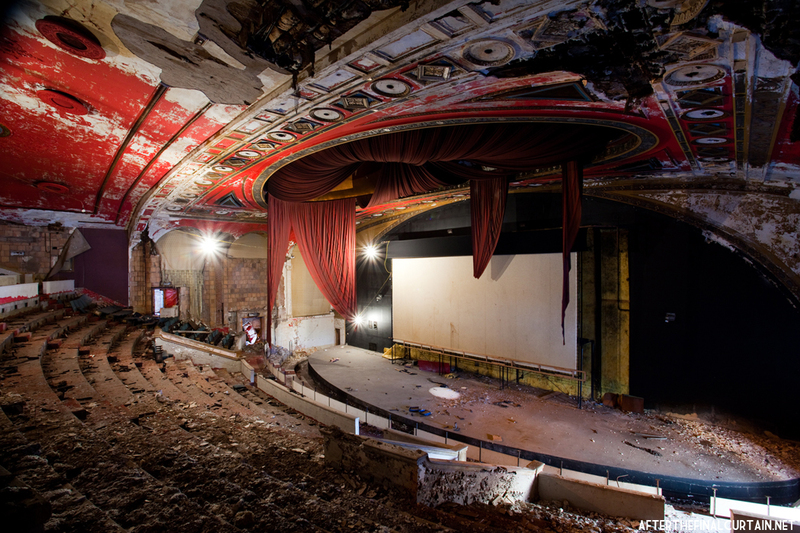 After being closed for over ten years, demolition of the Fabian was approved by New Jersey’s Department of Environmental Protection in 2004. The site was slated to become office space and parking for the Paterson Board of Education, but the project was never executed. 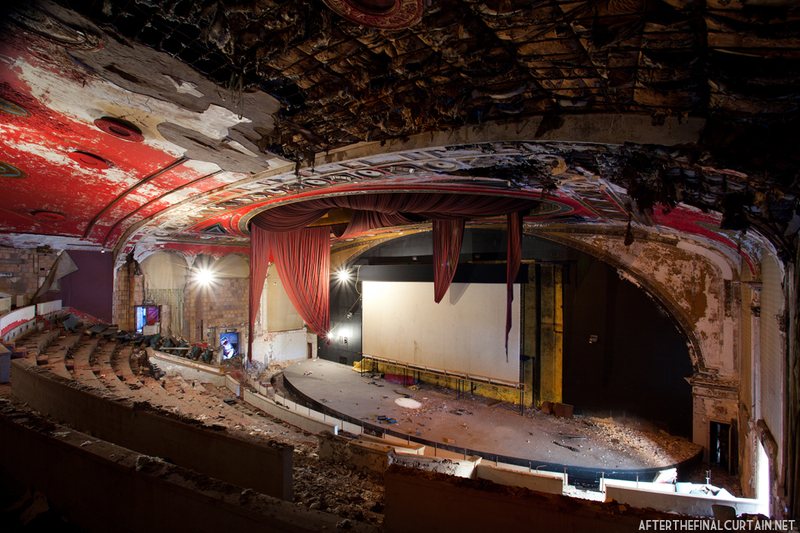 The theater was gutted to make way for condos and retail space in 2011. 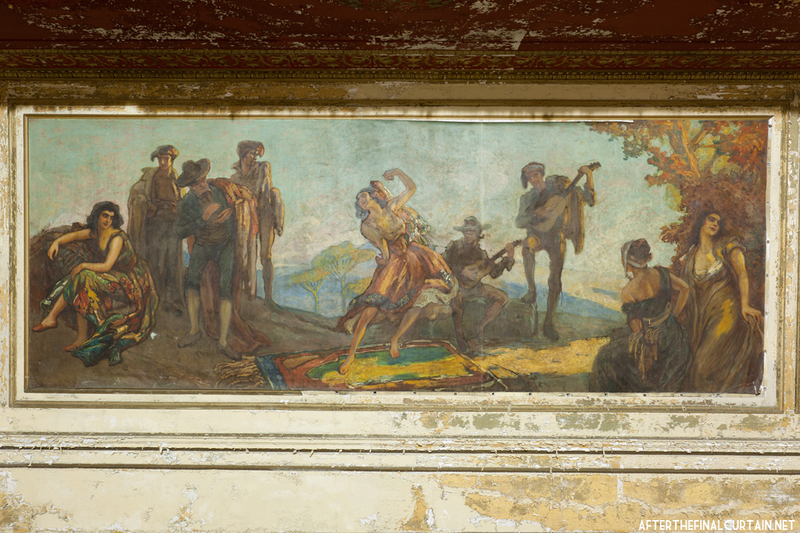 A closeup of the mural in the theater’s foyer. Another look at the back of the auditorium from the stage. Reblogged this on Dan Strange Studio. I believe it is slated to become retail space. 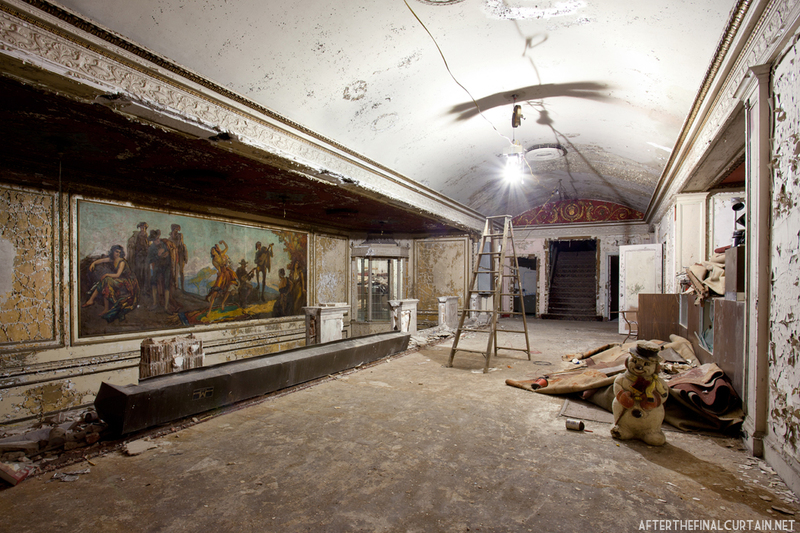 A restoration is no longer possible because the interior of the building has been stripped to the bare walls. Two comments Matt: First…”If wall could talk”…, and secondly, the walls would probably say “I’m so tired, they pulled pieces from me for years”. 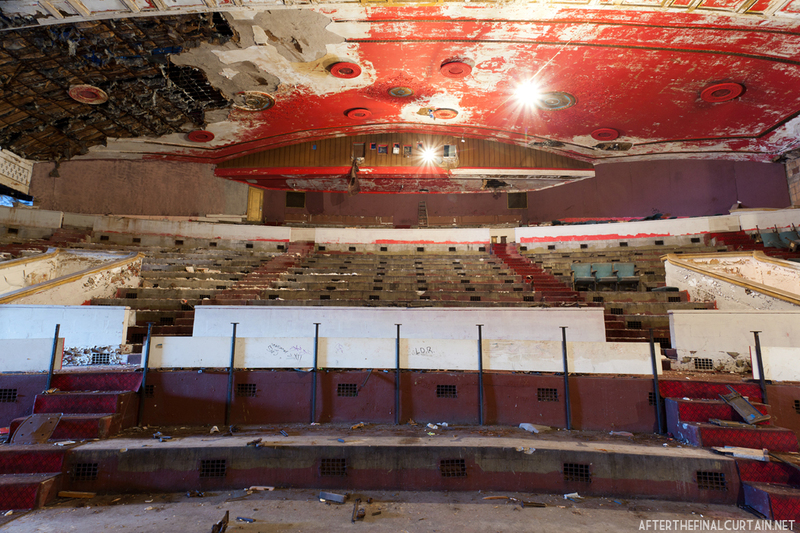 Great documentation on this theater’s history with wonderful photos accompanying it. Thanks for posting. I have many memories of this theatre although not around when it opened spent a lot of time there in the 50’s and 60’s. Although my favorite theatre in Paterson was the Garden. All the photos in this blog have a certain kind of haunted beauty… one can penetrate them and feel the atmosphere. Hey, my last name is Fabian, and I used to go the the Fabian Theater in the 1980’s, and had such a good time there. I made unforgettable memories there. I am curious about what will happen to the building. The interior was gutted, so there’s no chance of it being restored. had my first date there when I was 13. By that time it was on the decline. My mom showed up and made me leave. The stench of weed and all sorts of things made it an unsavory place but what stood out was the imagining what it must have been like years ago. Went there in the ’30s and ’40s…it was a movie palace…many good memories.